It’s helpful that, at age 77, George Clinton has a bit of belly. When you’re sporting a T-shirt that features your key album covers, and those key albums stack up to double digits, you can use some extra real estate. 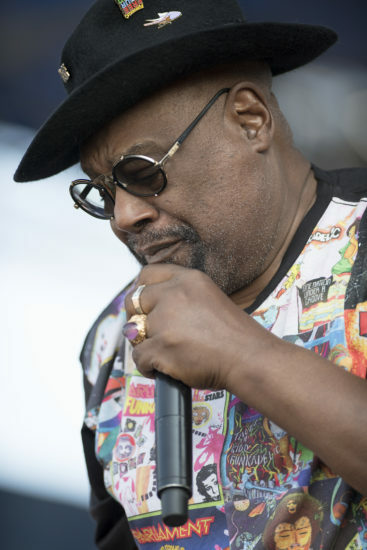 Uncle Jam announced his retirement earlier this year, so go ahead and deem these final tour dates a victory lap for a sage R&B architect and funk icon whose vision has brought the world some of its most irresistible grooves. Those grooves were in full effect during the fest’s closing set, where Clinton and crew cranked the volume and brokered a splash of next-level elation from the crowd. The stage was filled with 15+ musicians, and those numbers more than doubled when a bevy of audience members were invited up to keep the party going. The leader was beaming, his many accomplishments—from sustaining a band for a half-century to dispensing tumultuous joy on the reg—playing out before his eyes.